Typically you will find dream catchers hanging over beds to encourage good dreams while protecting from nightmares. Adding this belief to a dreamcatcher tattoo design will carry that power to block bad energy throughout your life. These circles are filled with woven mesh, decorated with beads and feathers are gorgeous, and very symbolic to their owner. Dream catcher tattoos are very popular, and while you can choose from pre-made designs, it’s also very easy to make them your own. 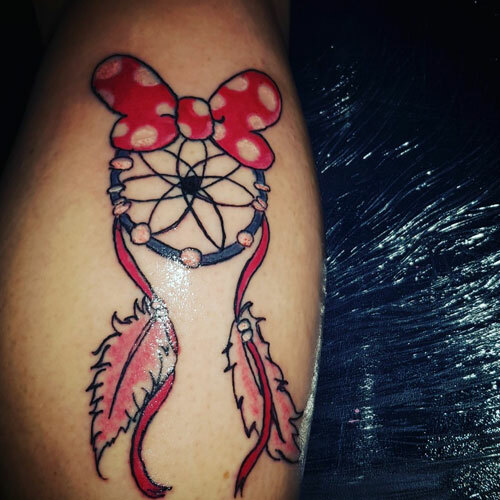 Below we will discuss more about dream catcher tattoo meanings and checking out a few designs to help you find the inspiration you need. Dream catchers are Native American symbols that are believed to hold on to good dreams and chase away bad ones. Experts believe the Anishinaabe people were the first to create dream catchers as a response to their belief in the Spider Woman. According to their culture, the Spider Woman would weave magical webs above babies’ cradles and prevent them from having bad dreams. The dream catcher is an evolution of that belief. Feathers were later attached to the dreamcatcher’s woven designs to entertain babies, and each movement of a feather in the breeze signified the arrival and passage of a healthy dream. For girls, owl feathers were common; for boys, eagle feathers were preferred. Some dream catchers were even known to incorporate gemstones. One gemstone signifies one true creator while four gems represent the four directions. The history of the dream catcher goes back centuries, but how you choose to use the history and make your own dream catcher design is a direct representation of you. 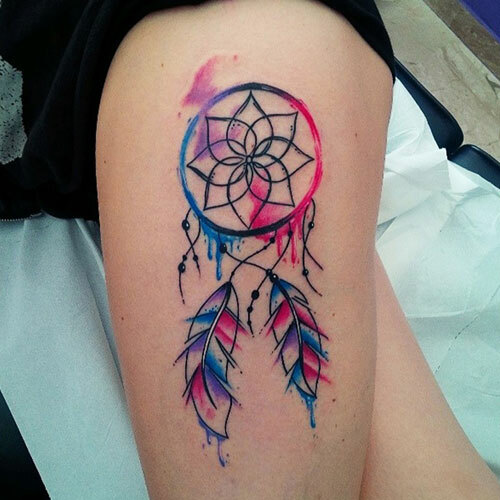 Have fun in creating your perfect dreamcatcher design while bringing the good energy this tattoo represents. There are many ways to make your dream catcher tattoos unique. 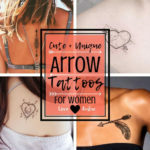 Whether you choose to have a small dreamcatcher tattoo, a thigh tattoo, or a dreamcatcher on your back, these designs always look unique and gorgeous. 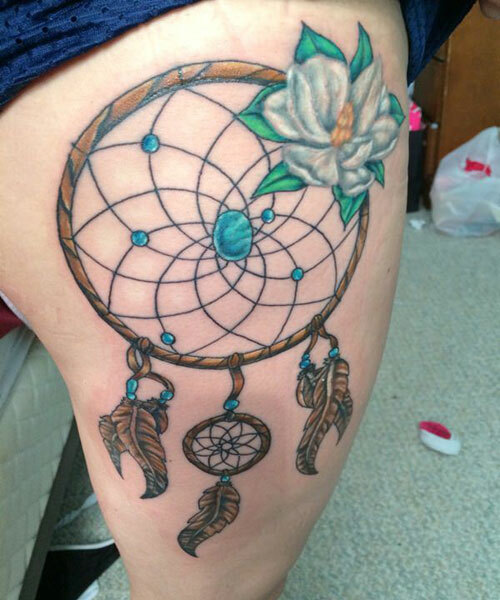 One of the most popular locations for a dreamcatcher tattoo is on the thigh. Having a thigh tattoo allows you to have more space for your design as well as the opportunity to have your tattoo on display or hidden easily. 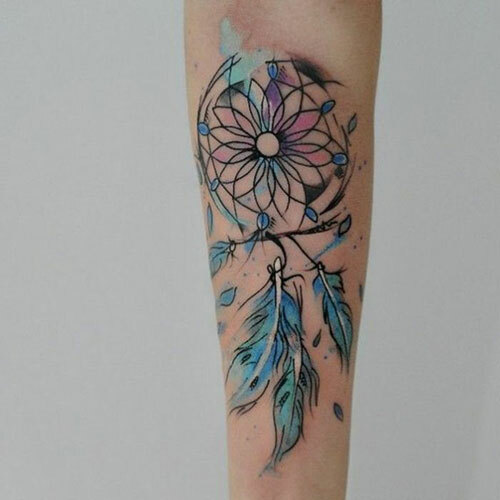 For those who love small tattoos, a simple inner wrist dream catcher is an amazing tattoo idea. Dream catchers are designs that look great with or without color. A simplistic all-black design above your wrist makes just as big of an impact as bold colorful designs. 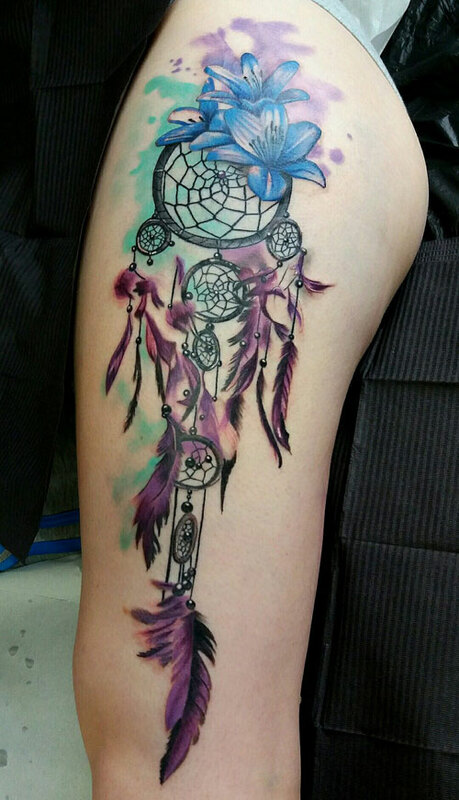 A small dreamcatcher tattoo can look perfect whether it is an ankle tattoo, wrist tattoo, or even behind your ear. Turquoise and brick red are two colors that are often symbolic of many Native American tribes. 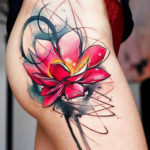 Incorporating these colors into your tattoo will pay homage to this. The back is the perfect location for a small dreamcatcher tattoo, or better yet, a big dream catcher design. This location is perfect to have a dream catcher full with design and personalized details. Getting a tattoo on your ribs is one of the more painful locations, but they can look absolutely gorgeous. This location also allows you to hide your tattoo when needed. This is one of the most common (and boldest) ways to tattoo a dream catcher on your body. For Disney fans you can find a way to incorporate Disney into anything – so why not a dream catcher?! 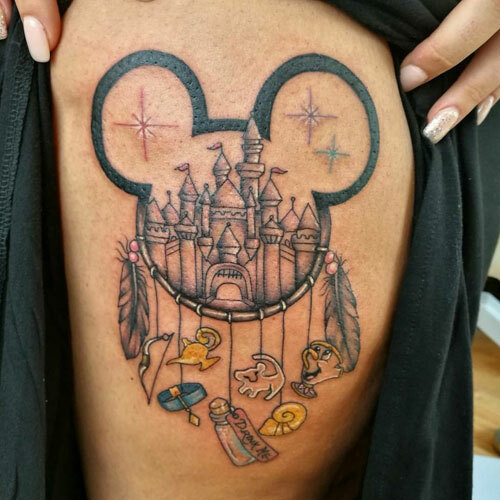 If you know me, you know I LOVE Disney, so I have to share some adorable Disney tattoo ideas for your perfect dream catcher tattoo. Whether you choose to have the traditional webbed ring, a beautiful lotus flower, or a simple heart, your dream catcher tattoo has endless possibilities to personalize your design. 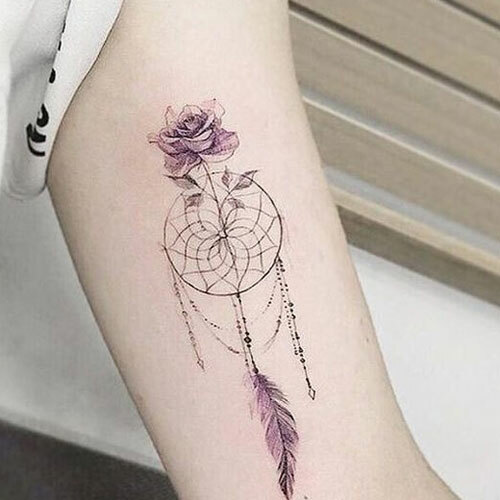 As you can see, dream catcher tattoos come in numerous unique styles, and whether you want something that’s incredibly simple or something more complex and realistic, it’s possible to make it your own. 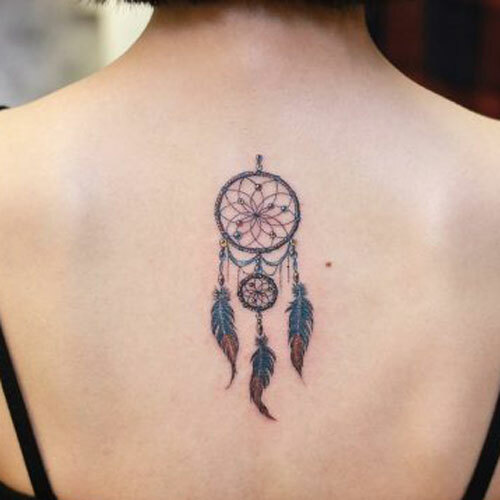 Both color and black-and-gray options can look simply stunning, so be sure to talk to your tattoo artist, get some advice, and bookmark your favorite dream catcher tattoo photos to give him or her an idea of what you want.